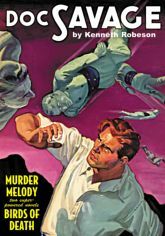 Thrill to the original pulp adventures of DC Comics' newest superstar as the Man of Bronze returns in two super-powered novels by Lawrence Donovan and Lester Dent writing as "Kenneth Robeson." First, violent earthquakes lure Doc Savage to Vancouver where he confronts the super-science menace of the flying Zoromen in a novel that inspired a classic 1940 Superman story by Siegel & Shuster. Then, Doc and Pat Savage journey to Africa to investigate a strange secret behind golden canaries and their lethal song in a tale plotted by Superman editors Mort Weisinger and Jack Schiff. This classic pulp reprint features the color pulp covers by Walter M. Baumhofer and Emery Clarke, Paul Orban's original interior illustrations and historical commentary by Will Murray, writer of seven Doc Savage novels.